Social media is a buzz about Watts Bar weeds. So we asked our TVA aquatic plant expert Dr. Brett Hartis – What exactly is going on with Watts Bar Weeds? It seems like there are a lot of theories about what’s going on with aquatic plants this year on Watts Bar Lake. We’ve heard everything from high water flows, commercial plant management companies killing weeds lake-wide, property owners dumping dangerous chemicals, to TVA has herbicide pipes under the lake. No, we’re not kidding. What happened to the Watts Bar weeds this year? Mother Nature – she holds all the cards with what plants do from one year to the next. You have to remember that many invasive plants can’t handle extended, deep cold snaps like we saw in January. It was under 20 degrees for a lot of that time. With much of Watts Bar and other reservoirs exposed in the winter, plant roots and other survival structures can be greatly impacted. Much of the growth that we saw this time last year has been delayed by weeks because of the cold. Along with the cold, the amount of rain and river flow has made it tough for all plants to grow well this year. The plants aren’t gone. TVA survey crews are already seeing some species racing for the top of the water. If we get a mild winter we can expect to see things happen a little earlier in 2019. But another cold snap and high spring flows can slow growth down even more. This is why TVA spends a great deal of their time surveying to see what the plants are doing from one year to the next. Will the delayed weed growth affect fishing? Bass are incredibly adaptive creatures. And just like the weeds, they can do things at different times each year based on what Mother Nature has delivered. You may not catch the same fish on the same stand of grass on the same day that you did in 2017, but the fish are still out there, probably just a few weeks delayed in their habits just like the weeds are. 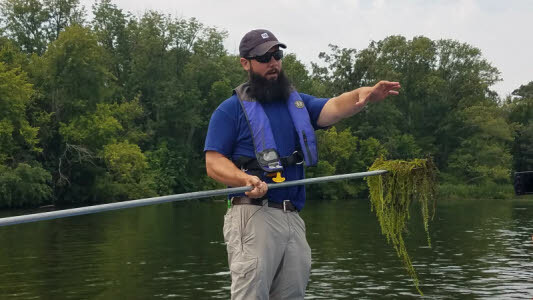 Check out TVA’s Angler’s Aquatic Plant Identification page to learn season based strategies for finding and fishing the weeds. Has TVA treated for aquatic plants this year on Watts Bar? No. Mother Nature did a job on the weeds this year and things are progressing slower than normal. Despite multiple surveying trips, we’ve not had to treat any public boat ramps or developed public access areas on Watts Bar this year. Given our most recent surveys, some areas may be treated soon while others may not need management at all! People often confuse our airboats with application boats. In reality, TVA boats are just out surveying the shallow waters around public boat ramps, swim beaches, etc. We need the shallow water clearance that an airboat provides to get into some of the places that we monitor. We’ve also seen folks confuse the way an airboat operates with the term “spraying for weeds.” People think the “mist” or “spray” out of the back of the boat is herbicide. The truth is its just water being pushed through the prop. Boats treating for underwater plants use weighted drop hoses attached to the back of the boat that fall down into the water column. 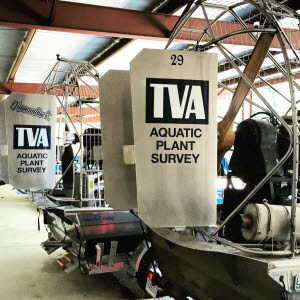 You can identify a TVA survey airboat by the “TVA Aquatic Plant Survey” sign on the fin of the boat. 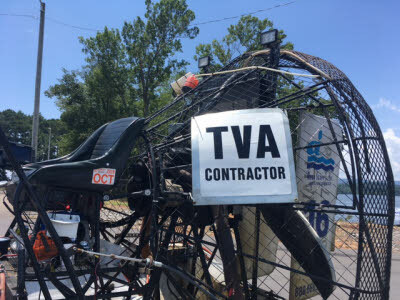 Contractors who do assigned treatments for TVA will have a “TVA Contractor” sign on their boat. Furthermore, when doing an application, applicators have a flashing light running on the boat as well. Any treatment activity you have seen thus far has been done by commercial applicators for private property owners. How much of Watts Bar Lake does TVA treat? TVA only monitors about 20 acres of the nearly 39,000 acre reservoir, all of which are in and around public access areas. TVA does not manage vegetation along residential and commercial shorelines. We care about the environment and your safety. When we prescribe a treatment at public access areas, we use only EPA approved aquatic labeled herbicides. All sites are posted with application date, products used, and any associated restrictions. Remember that TVA’s reservoir system is worth about $12 billion to the economy and 130,000 jobs.We are very careful because want to be want to protect you, the environment and this tremendous investment in our communities. For more information about aquatic labeled herbicides and aquatic plant management science, visit the Aquatic Ecosystem Restoration Foundation Best Management Practices Handbook. For treatment schedules on each reservoir, visit TVA’s Aquatic Weed Treatment Schedule Page. What’s the craziest social media rumor about weeds on Watts Bar? There have been a few online whoppers this year. The first that comes to mind is that TVA is treating the lake by releasing chemicals from the dam when we generate power. Another tall-tail is that TVA has “black helicopters” that spray for weeds. My all-time favorite is that the air coming from TVA airboats contain herbicides, as is mentioned earlier. None of these are true. The fact is only State licensed/certified applicators can treat for aquatic plans in the state of Tennessee. 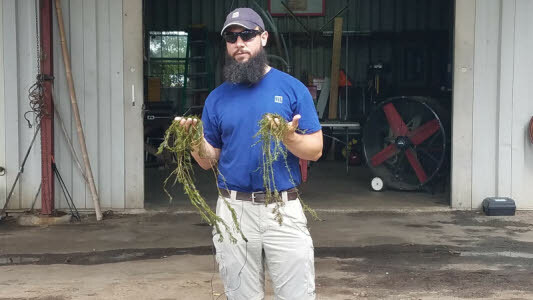 Is aquatic plant management DIY? Aquatic plant management is NOT a do it yourself project in the state of Tennessee. The fact is that it’s illegal in the state of Tennessee to apply aquatic plant herbicides UNLESS you’re a licensed/certified applicator. I think that we can all agree that we only want people who know what they are doing to manage these plants – that protects you and the environment. Who can the public contact if they suspect illegal herbicide applications? Contact the Tennessee Agriculture Consumer and Industry Services Complaint Hotline at 1-800-628-2631. If you have questions about TVA’s Aquatic Plant Management Program, call 1-800-TVA-LAND.